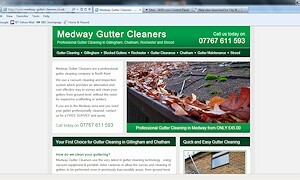 Medway Gutter Cleaners, unsurprisingly, given their name, offer a gutter cleaning service to the good people of Gillingham, Rochester and Chatham in North Kent. They provide professional, affordable high level gutter cleaning for businesses and homes. They can even install gutter guards to prevent your gutters getting blocked in the future. Their aim was to be top in the search engines for gutter cleaning services in the towns in the medway area, all on a tight initial budget. Their site has only just launched, but previous experience has show that it should be first page in google in a week or so. So if you are in Chatham, Gillingham, Rochester or Strood, and your gutters are blocked, contact Medway Gutter Cleaners for a FREE no obligation quote for your gutter cleaning.